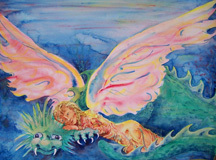 We were surrounded by Dragons, my Dragons, at Vashon Intuitive Arts the night my show opened. People buzzed with juicy conversations inspired by the stories my paintings tell, as I limped around the room with my bad knee. My knee is much better now. I can go up and down stairs without having to slide down on my bottom, and I am looking forward to sharing some of the Dragon Stories that have inspired my paintings and my life over the years. On April 28th, at 7:00 pm, I will be telling stories at Vashon Intuitive Arts. I do hope you can come! Meantime, my cards and prints will be available on my etsy shop soon, and are available now at Vashon Intuitive Arts, 17331 Vashon Highway SW, Vashon, WA.